In last week’s edition of the TechLife Newsletter, you saw some exciting news about Pillar Technology. 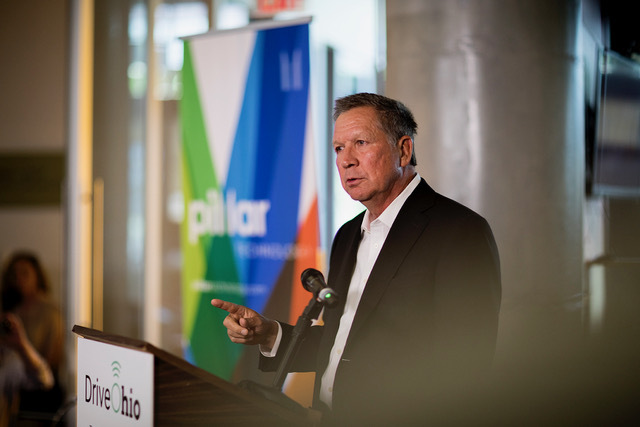 With Governor John Kasich in our Forge in the Smith Brothers building, we announced that we’ll be opening an Autonomous Vehicle Research and Development Center in Central Ohio, and the Governor announced an executive order allowing for autonomous vehicle testing on all Ohio roads. It was a monumental day for Ohioans and beyond. Today, I’d like to share some additional information on our Autonomous Vehicle Research and Development Center, which is enabled by a grant from JobsOhio. This planned facility is another step forward in moving technology from idea to action in our state, as the research center will actively test and evaluate new technologies, research autonomous vehicle use, and provide solutions for safe implementation. These aren’t just ideas, and they aren’t just cool technologies. Imagine mobile solutions to transport single mothers to doctor’s appointments. Imagine leveraging embedded technologies to improve automotive safety, leading to saved lives. We’re developing real solutions to real problems, aimed to help people like you and move our City forward. As the City, its partners, and its people continue to push towards a future of increased physical and social mobility, access to opportunity, and quality of life, we recognize the need to designate a space for collaboration and innovation—specifically in regards to autonomous vehicles and mobility solutions. These technologies will play a significant role in the smart city of the future and, as leaders in the embedded software space, we at Pillar are looking to accelerate their development today. The future is molded by doers, and with this Center, we’re looking to execute on big ideas with lightning speed. This Center represents another significant step towards positioning Columbus as a smart city and mobility leader. We at Pillar are incredibly excited for the future of our City—but we won’t be able to get there alone. Innovation is an exercise in collaboration, and we’ll need to bring the full force of Columbus to bear in order to generate maximum impact. With that in mind, I’d like to invite you to join us on our latest journey. If you’re a coder or creative, executor or ideator, we’d love to have you. At Pillar, we believe in bringing diverse minds together to collaborate and deliver innovative solutions—the Autonomous Vehicle Center will be no different. If you share our passion of shaping a brand-new future for Columbus, let your voice be heard. In the spirit of shared mobility, we’d love to bring you along on our ride.